A little more about our journey to going green. …then you’re going to politely decline. I didn’t wake up one morning, in a hazy, sleep-deprived state, and declare with my first cup of tea in hand that today was the day we are ‘going green’. There was no defining moment of clarity, no direct source of inspiration. It was more of a slow trickle effect, unnoticeable to outsiders at first. Yet after a couple of years introducing small changes into our day to day, my friends now cite me as their ‘green’ point of reference. I’ve become very passionate about adopting a more environmentally friendly lifestyle. It continues to be a journey which I weave into every aspect of our lives. I want to share with you how - even with three young children, and extreme sleep deprivation and a tight family budget - we’re finding our path. And you can too. It’s really all about the tiny victories. It doesn’t have to be all or nothing. What does embracing a green lifestyle mean to you? Walking more, driving less? Touring the weekend farmer’s markets with hipsters filling wicker shopping baskets of their vintage bikes with kale and rainbow carrots? Going off the grid towards self-subsistence? Organic spelt and vegan baked goods? Composting? Babies toddling about in cloth nappies decked out in fair-trade organic cotton clothes? Is it recycling more? Or becoming a family that produces just a single mason jar’s worth of household garbage for the year? Going green means different things to different people. To some it's minimalism. To others it’s waste equals food. To some it demands a complete lifestyle overhaul, an all-or-nothing leap. And still others find a middle-way, a slow progression towards resourcefulness, consciously embracing a more simplistic approach, making, re-using or simply going without. There are no rights and wrongs. There is no competition, no code of green conduct. Like any new lifestyle it's the feel-good component that sustains you. Does it really have to cost the earth to save the earth? Is ‘green’ pricing people out of the market? Is it possible to embrace an environmentally friendly lifestyle on the average family budget? 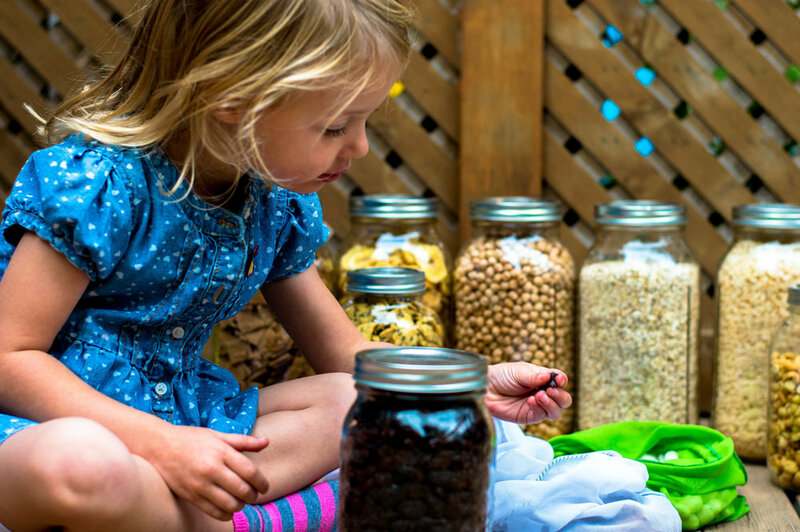 3 ways to reduce your families’ environmental impact on a budget. Organic food. If (like us) eating 100% organic is not financially possible, take a look at the “Dirty Dozen” and “Clean 15” lists. They refer, respectively, to the fruits and vegetables that are the most and least contaminated by pesticide use. For example, organic oranges or bananas (thanks to their thick skins) can be lower priorities than organic lettuce or carrots. Choose wisely which organic produce to buy, this will dramatically reduce the amount of pesticides you consume in a cost-conscious way. Rather than wasting money on processed food that often comes in several layers of unnecessary plastic packaging, why not try to make your own crusty bread loaf, or a tomato and sweet-basil pasta sauce, or some roasted red-pepper humus? Choose simple recipes, with few ingredients. Eat better, and create less waste. Buy dry-foods in bulk stores. Seeds, nuts, dried fruits, spices. Buy the exact quantity of food needed. This reduces food waste and the quantity of household garbage produced (see this post) for ideas. And once this is a habit, then try taking your own glass jars back and forth to the bulk store. Use glass jars to store food in your fridge. Leftovers are more easily spotted. Buy produce in season and food which has been locally grown. Minimalism and the ‘less is more’ concept. Choose clothes wisely. Buy less, be a conscious consumer. I've found owning a capsule wardrobe (Just 22 items) to be very effective. (Tune in next week to read my new post on my capsule wardrobe). Ease into a greener way of life slowly. Rather than replace all your current cosmetics/cleaning products, use what you have then purchase greener alternatives or make your own products. DIY cleaning products and facial products can be incredibly easy to make. Use the simple, natural ingredients you will have in your cupboards. Use washcloths instead of paper towels, cloths instead of baby wipes. I love the concept of “going green”. It’s important to be aware of our resources and be mindful how we use them. I’m convinced we’re all capable in our daily lives to make a difference, educate our little people and help preserve nature. Love to hear your thoughts about the green movement. What tips can you share to help others go green without breaking the bank?